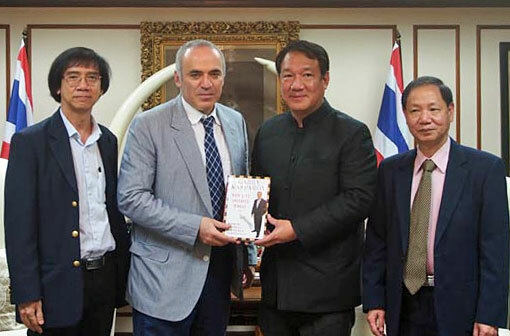 FIDE Presidential Candidate Garry Kasparov and running mate Ignatius Leong arrived in Bangkok, Thailand, and were immediately whisked off to the Ministry of Finance. 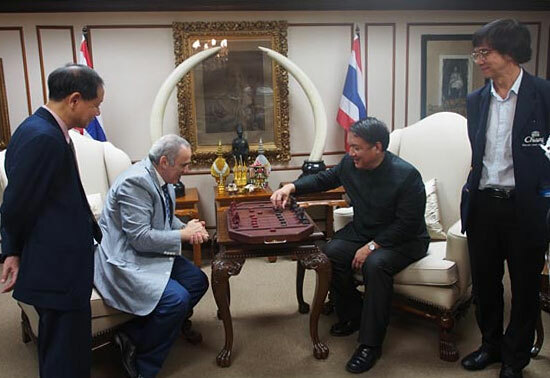 There they made a call on Deputy Prime Minister and Minister for Finance, Kittiratt Na-Ranong, who is also President of the Thailand Chess Federation. 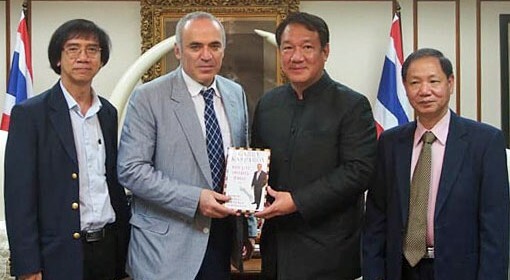 Kasparov and the Deputy Prime Minister shared their views on chess in Thailand, the region and the world. 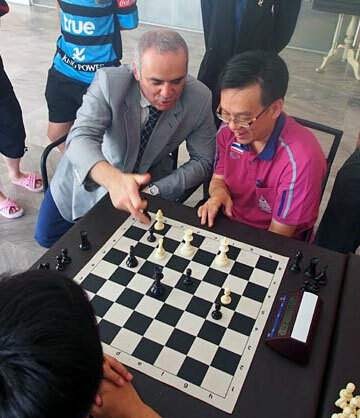 Mr Kittiratt agreed with Kasparov on how and why chess could play major roles in education and social networking. 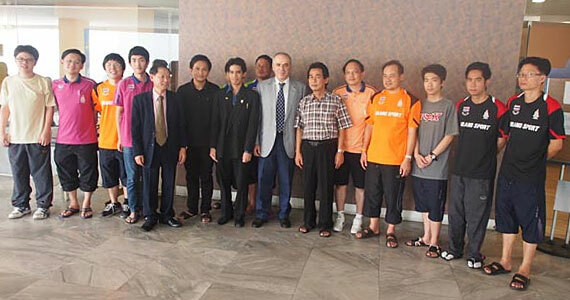 Mr Kittiratt endorsed the TCA’s support for the candidacy of Kasparov for FIDE President. This is a board game descended from the sixth century Indian game of chaturanga or a close relative thereof, and therefore related to chess. It is regarded as the most similar living game to this common ancestor of all chess variants. 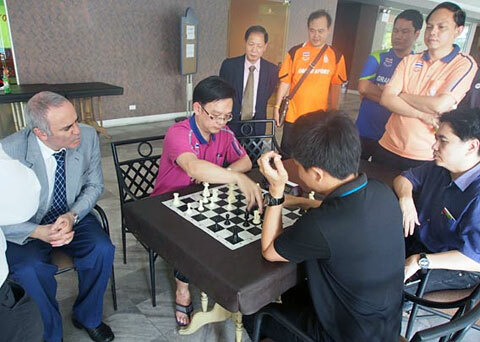 There are around two million Thais who can play makruk, while 5000 can play chess. 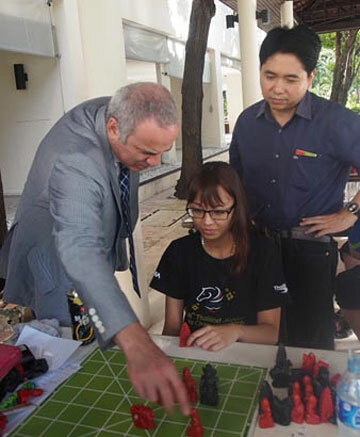 Kasparov was taught the rules for ASEAN Chess and Myanmar Traditional Chess. He learnt that ASEAN Chess is a hybrid of Chess, Thai Chess and Myanmar Chess and was first introduced into the SEA Games in 2011. 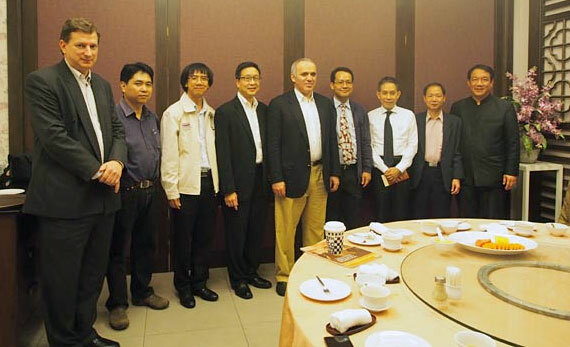 At the dinner hosted by Deputy Prime Minister Kittiratt Na-Ranong, Kasparov was introduced to Board members of the TCA, who paid intensive interest in Kasparov’s plan to implement reform on the policies of the future of FIDE as well as on the roles of how key national federations in various regions could play to support the global activities in FIDE and the Chess in Education programs. Kasparov received resounding applause when Mr Kittiratt re-assured the support of Thailand for Kasparov for the FIDE Elections next year.